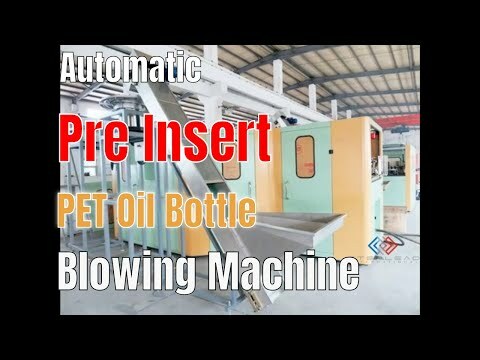 The BMH-A5 automatic blow molding machine is fully automatic blower for PET bottle with handle from 2L to 5L, which developed by our company using advanced bottle making technology. The machine has the characteristics of automation, high intelligence, stable and reliable machine performance, simple structure, high production efficiency, low energy consumption, and no pollution from intermediate links. It is widely used in the production of food, beverage, cosmetics and medical containers. Automatically discharging embryos is stable and reliable, and automatically controls the embryo according to the stock of the material. When the preform warms up, it is evenly heated and easy to blow. Warming light box adopts automatic mutual feedback and closed-loop adjustment system, which can automatically and consistently output with constant power, which is not affected by voltage fluctuations. The clamping mechanism adopts the double-bend composite hinge combined with the buffer cylinder, which has large clamping force, stable operation, sensitive and reliable action, and completely eliminates the phenomenon of rising mode. Adopt four-point synchronous mold adjustment mechanism to make the mold adjustment easy and precise. Adopt modular design and strong applicability. According to the processing property of plastics and the processing technology of the products, it can be equipped with aluminum oven, infrared oven, or corresponding pull-blow parts. This model is suitable for PET/PC/PP/PS/PMMA and other plastic polyester blowing. A variety of hollow products. This model adopts manual and automatic conversion circuit control for easy adjustment and production. The automatic control adopts multi-point adjustment circuit, which can adjust the action time of clamping, stretching and blowing, and maximize the product forming effect and product qualification rate. Have ISO9001 and CE international quality certification to assure our high quality products. Exported our products to Japan, Europe, South & North America, Southeast and Middle-east of Asia, over 100 countries and areas. Machine is adopted the most advanced and market trend-leading technology, facilitating customer holding the most superior competition position. The preform fetcher, preform feeder, bottle fetcher, and the bottles line up are all automatically completed by the robot to avoid intermediate pollution.